Our platform for fostering conversation on product development and product lifecycle management topics of interest with the community. I was once told by a serial Life Sciences Entrepreneur (with both Biotech & MedTech exits) that when it comes to taking care of their young (early stage ventures) the Biotech industry is “mammalian” and MedTech industry is “reptilian”. In other words, Biotech/Pharma nurtures their young (In-licensing/Out-licensing deals) and MedTech eats their young (acquisition/do not commercialize). While I can understand why many people might have that perspective I can honestly say that there are many constituents (“good actors”) in the MedTech ecosystem that day after day do the little things (as well as the big things—i.e. funding, licensing, acquisition, etc.) that make a difference in successfully “raising an early-stage MedTech venture". In fact, as is often the case in life it is often the most successful and reputable organizations/people that go beyond what is expected in contributing to successfully raising the proverbial child. EdgeOne Medical, an Innovation Partner in the 2018 MedTech Innovator program, would like to recognize the efforts of the MedTech Innovator organization in cultivating a nurturing ecosystem of “good actors” who truly go beyond what is expected in supporting hundreds of early-stage MedTech ventures from around the globe. Over the past six years, Paul Grand, MedTech Innovator Founder & CEO, as well as his high-performing team members including Kathryn Zavala, Jenell Paul-Robinson, Jennifer McCaney, Johnny El Chemmas, and Tyra Dubose, have exuded the common characteristic of going beyond what is expected in supporting the needs of hundreds if not thousands of early-stage MedTech ventures. 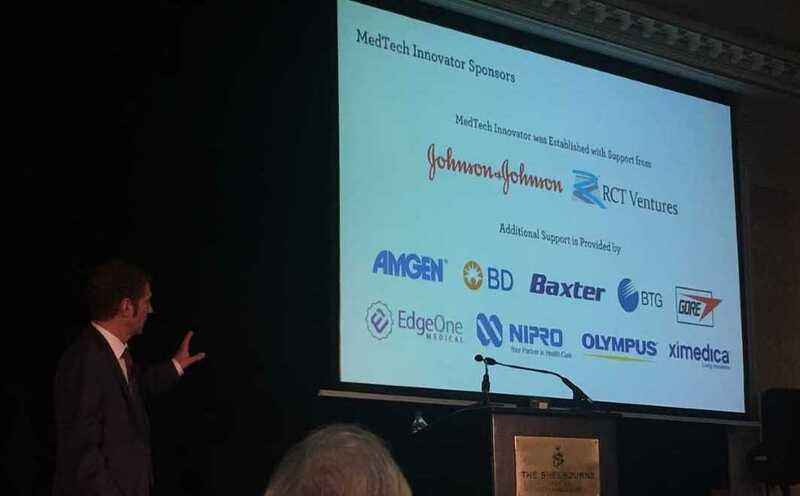 I have seen first-hand over the past several years as a member of the AdvaMed MedTech Conference Business Development committee how the MedTech Innovator global program has evolved and grown to become an indispensable part of the MedTech Innovation Ecosystem. (In a separate post I will recognize AdvaMed and AdvaMed Accel for being the ultimate “good actor” and catalyst for the MedTech Innovator Program inception as well as founding partners J&J and RCT Ventures). It is only after years of working collaboratively with others—often on “little things”—that you see the significant contributions made by the many “good actors” in an ecosystem/village and, more importantly, the successful development of the “children”. The MedTech Innovation Program has evolved to this: In 2018 approximately 800 MedTech ventures applied to participate in the MedTech Innovator Program. In 11 regional competitions around the world—regional investors and “Strategic” MedTech Manufacturers reviewed, nominated and evaluated applicants. Ultimately the “Strategics” and global investors selected 50 ventures to participate in the MedTech Innovator Showcase/Accelerator program from a large and robust group of qualified MedTech ventures (Note to this year’s participants who are not in the Showcase or Accelerator—be involved again next year—the investors and “Strategics” follow your progress over years, not months). So in a nutshell, the best regional MedTech ventures from around the world are nominated/curated by regional MedTech investors and “Strategics”. Then the 50 MedTech Innovator accelerator/showcase ventures are chosen by global MedTech investors and “Strategics” based on the “regional” input and their own preferences. Just to get to this point in the 2018 MedTech Innovator Program--hundreds of individuals from regional/global MedTech investors and “Strategics” have invested thousands of hours in reviewing and in most cases conversing with hundreds of the applicant MedTech ventures. Representing EdgeOne Medical as a judge at five of the 11 regional competitions and in evaluating applications—I saw firsthand how much other partners like Johnson & Johnson, Baxter, Amgen, Ximedica and others contributed in terms of manpower to support the evaluation and nurturing of the early-stage MedTech ventures---some of these companies will have more than 20 people involved in evaluating and mentoring! Most importantly I saw how much these individuals from normally very competitive and secretive firms (Investors & Strategics) work together to help nurture individual MedTech ventures—in my opinion it is very “mammalian”. In summary, the MedTech Innovator is the "one" global competition and accelerator that brings a diverse global population of MedTech ventures, investors, and "Strategics" from MedTech & Pharma all under one tent and acts as a de facto "finishing school" for high-potential MedTech ventures. In closing, EdgeOne Medical would like to thank all the contributors to the MedTech Innovator Program globally and regionally—too many to name here but we know how much you care about the people and ventures you are nurturing. Day after day, year after year you are providing acts of significance. Lastly, we would like to thank the most important member of the ecosystem and the reason the MedTech Innovator Program exists: the early-stage MedTech venture teams/individuals who have the most challenging role in MedTech innovation ecosystem. We all recognize it takes longer now and the competition has never been greater—but most of us agree there has never been a better time to be a MedTech Innovator. We admire you and wish you success and fulfillment on your journey. EdgeOne Medical is a Medical Device and Combination Product Testing House and Consultancy Headquartered in Chicago, IL. We support over ten of the top 50 global BioPharma and Medical Technology firms as an extension of their device R&D organizations. We also support many emerging and venture-backed firms in MedTech, Biotech, and Digital Health around the world. We have the capacity and flexibility to support our clients from product concept through commercialization or we can deep dive in verticals such as testing. We derive great satisfaction in playing a small but important role in supporting the development of life-enhancing Medical Technologies in collaboration with great people and organizations.